FARO Jalapeno Peppers are Nationally Recognized for Outstanding Quality. 4-5% Defect Rate Versus 20% Average. With a focus on high volume and quality, our packing partners in Veracruz, Mexico "Faro" help us produce one of the best Jalapeno canned products on the market. Empacadora Del Golfo with a new State of the Art Facility Located in Veracruz, Mexico. helps Consolidated Mills import over a million pounds of Jalapenos a year that are distributed to Texas grocers, restaurants and businesses. Dec-Mar The 1st crop located in Chihuahua is the largest and most reliable crop of which most jalapenos are packed. 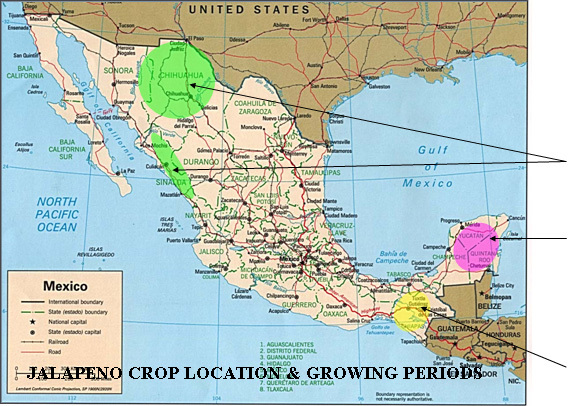 2nd crop is located in the Yucatan Peninsula and produces a variety of pepper that is very suitable for Nacho Sliced because of the thicker meat in the walls. The 3rd crop is from the Chiapas region and is basically a fill in until the Chihuahua crop comes in. The FARO Jalapeno Peppers come from two areas of Mexico that have rich soil and a history of agriculture for only the finest Jalapeno's in Mexico. The 1st crop located in Chihuahua is the largest and most reliable crop of which most jalapenos are packed. 2nd crop is located in the Yucatan Peninsula and produces a variety of pepper that is very suitable for Nacho Sliced because of the thicker meat in the walls of the Jalapenos. Site Designed and Optimized by Global Graffiti Inc.